New Revolutionary Technology. Twice as much gas in a cartridge! These revolutionary chargers contain twice the gas of regular N2O chargers and make twice as much cream in seconds! Our easy to use two piece N2O charger holder will allow you to use our revolutionary 16 gram N2O chargers with any existing 8 gram N2O dispensers on the market! Just insert the 16 gram N2O charger in the holder, connect the two pieces together and twist on your N2O dispenser! No other equipment necessary! 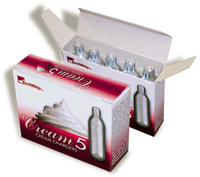 Each box contains five (5) 16 gm N2O Chargers that can be used with any of our whip cream dispensers. (Must use 16gm N2O Charger adapter). Every nitrous oxide charger manufactured is produced with the best gas available to ensure great tasting whipped cream every time!